How is it possible that I haven’t yet written about one of my most favorite plant groups: the scented geraniums? Not the hardy geraniums (Geranium) that have aromatic foliage, such as bigroot geranium (G. macrorrhizum), or the ordinary zonal geraniums (Pelargonium x hortorum), which have funky-smelling leaves but are grown primarily for their flowers; I mean the scented Pelargonium species and hybrids grown specifically for their fragrant foliage. These fascinating plants had their heyday back in the 1800s, then mostly fell out of favor, for some reason. In her 1932 book The Fragrant Path, Louise Beebe Wilder mentions that “Early in the nineteenth century…there were over 200 varieties to be had in England, and I dare say as many in this country….To-day no notice is taken of them at all.” Even over the last few decades, I’ve seen lots of plants come in and go out of favor, but scented geraniums have remained sadly overlooked by almost everyone, apart from a special subset of herb aficionados. That needs to change. 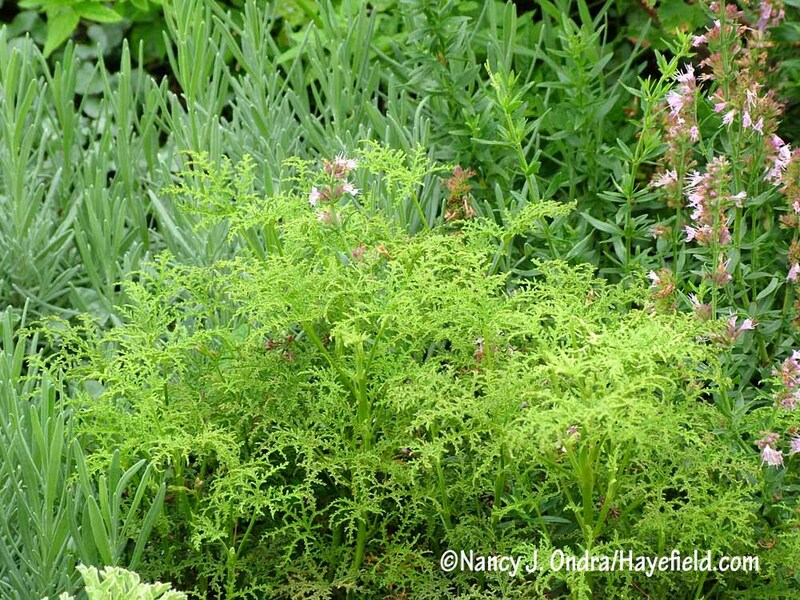 Granted, they’re not the showiest plants: Though some have colorful flowers, and there are quite a few options for striking textures and interesting leaf markings, these are not plants that attract attention from casual passersby. They are plants you need to interact with — to touch, and to smell — to reveal their best features. In a large garden, they’re practically pointless; in a small garden, in a path-side planting, or in a container, they are invaluable for creating a memorable experience. I will always remember when my own obsession with scented geraniums began: back in 1989. It was on a road trip to Connecticut, when a friend and I visited Logee’s Greenhouse in Danielson and then Caprilands, a magical collection of herb gardens in Coventry created by a woman named Adelma Grenier Simmons. By the time we headed home that evening, I had interacted with so many fragrant plants that I couldn’t even distinguish among them any longer. 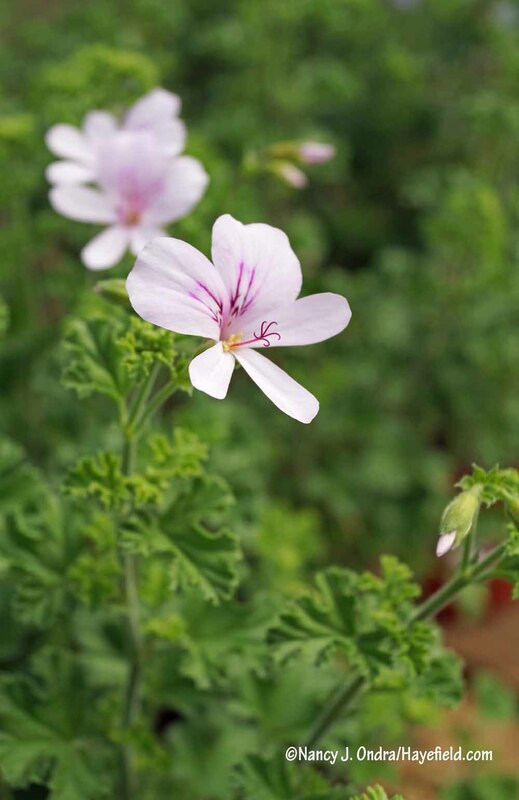 But to this day, any scented geranium has the power to take me back to hours of delight in those endless, plant-packed greenhouses and sun-drenched herb gardens. 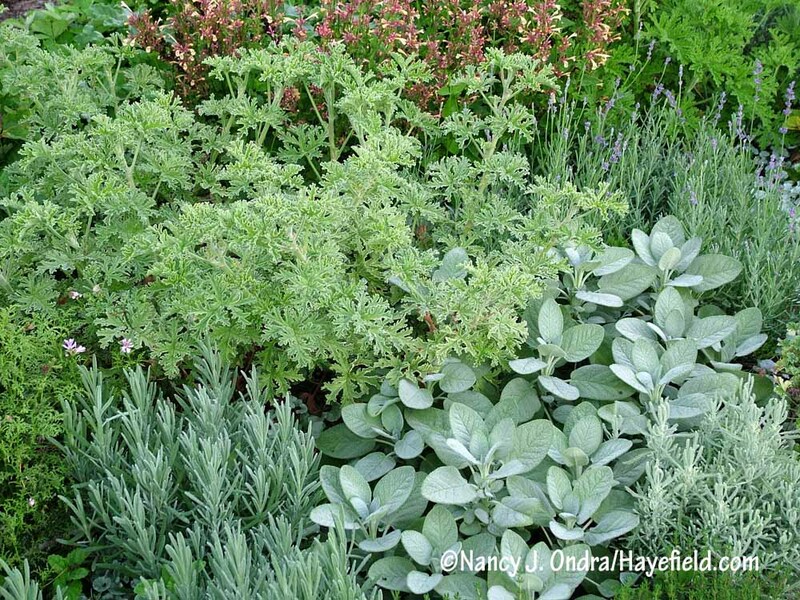 It’s not unusual for herbs to smell like other plants: there’s caraway- or oregano-scented thyme, for instance, and lemon or lime balm, and cinnamon or lemon basil, to name just a few. 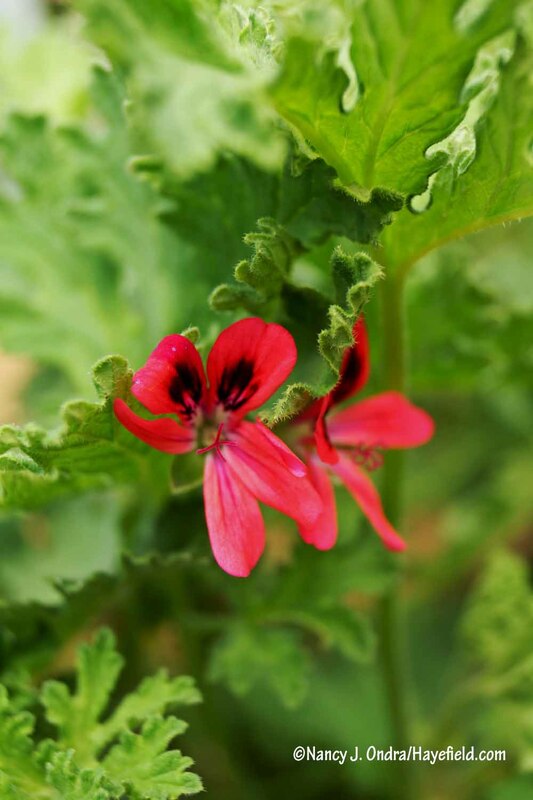 But the scented geraniums offer the widest range of fragrance options, by far, from flowery to fruity to spicy to minty to resinous, and their primary scent is usually indicated in their name. To be fair, you have to be able to use your imagination with many of them. 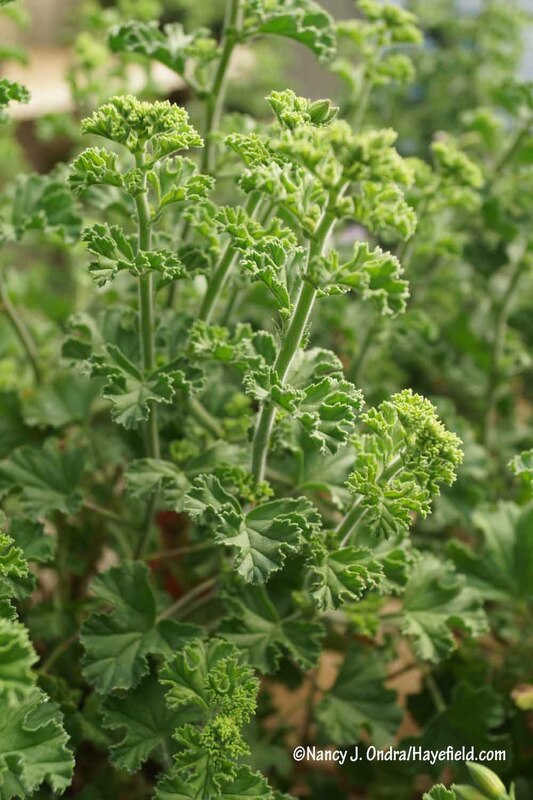 A lemon geranium does not smell like a freshly cut lemon fruit, for example, nor does a rose geranium smell like any particular rose flower — to me, anyway. 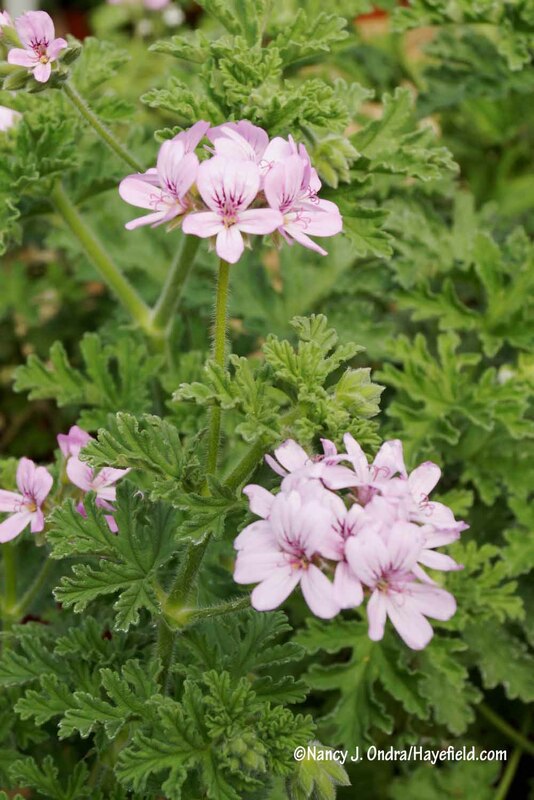 But once you’ve smelled a particular scented geranium, its scent is likely to be distinct enough for you to recall if you ever smell it again. 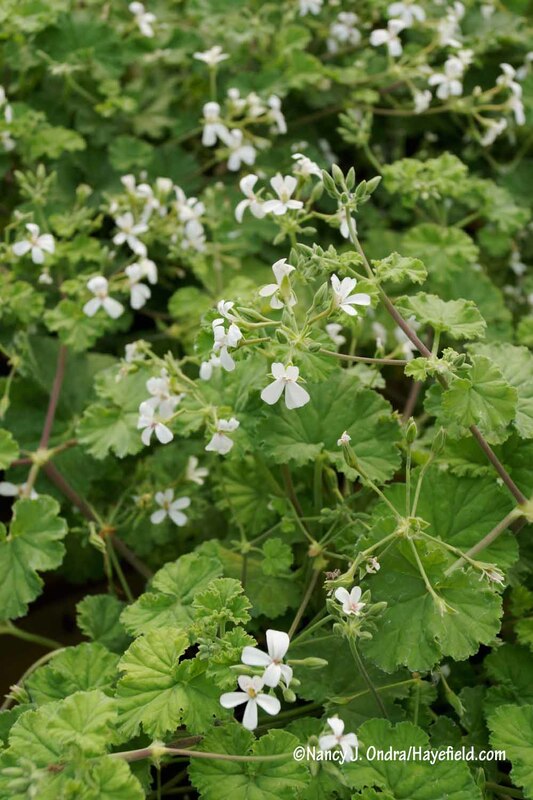 My absolute favorite scented geranium for fragrance — and texture, and vigor, and well, just everything — is peppermint geranium (Pelargonium tomentosum). Those big, furry leaves simply beg to be petted, and in return for that attention, they release a powerful, purely peppermint scent. 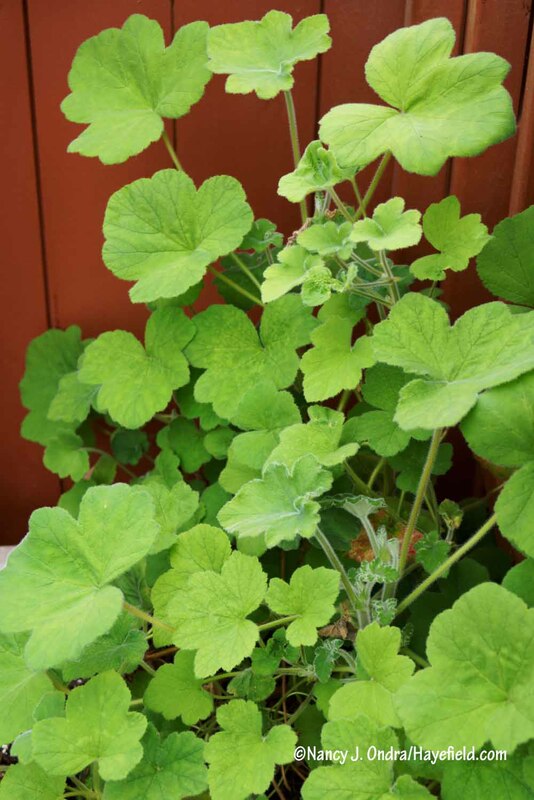 The plant can be somewhat mounded but mostly has a trailing habit, so it’s terrific in a planter or a large hanging basket or windowbox. It’s bold enough to show off well at ground level, too. 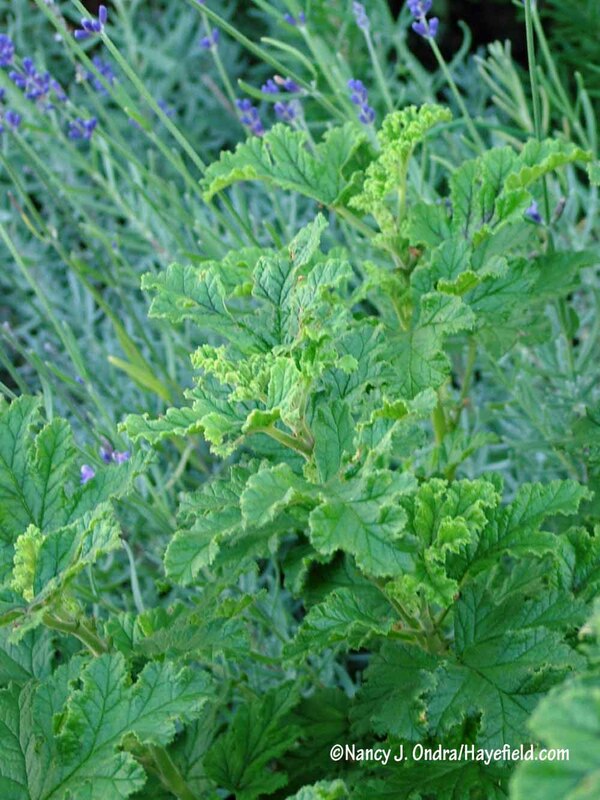 Rose geranium (P. graveolens) tends to be one of the more readily available options in this obscure bunch of plants. Don’t expect a sweet or fruity, hybrid-rose scent: it’s more of a strong, old-rose sort of aroma. 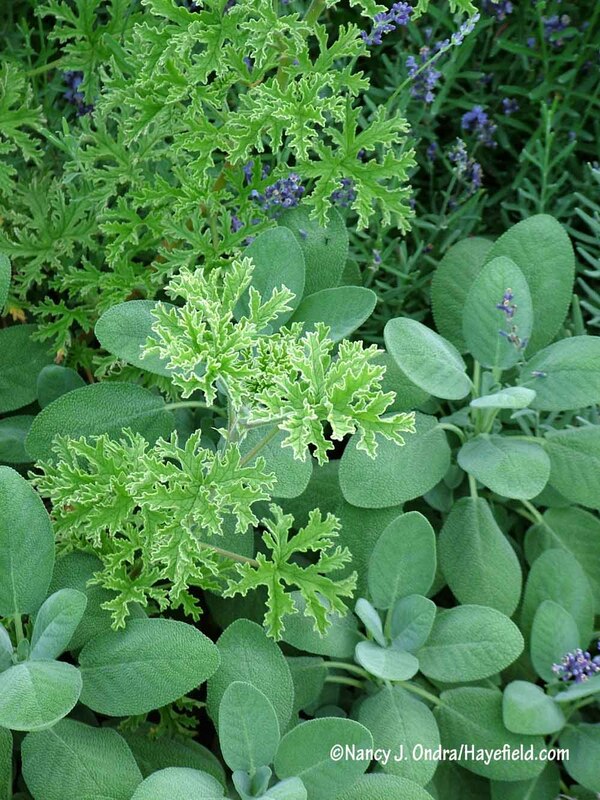 The plants are vigorous and bushy — perfect as a filler in a large planter or border. 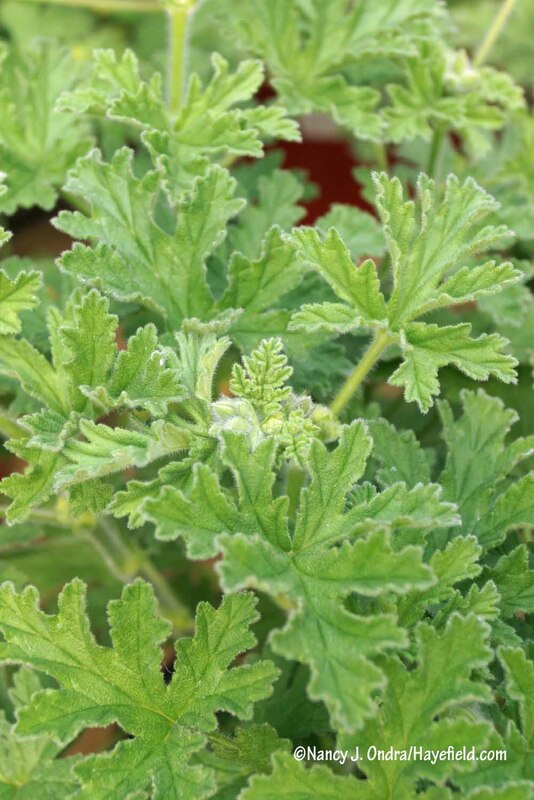 Lemon geranium (P. crispum) is distinctly different, with small, crinkled leaves on distinctly upright stems. Another smaller-leaved scented, nutmeg geranium (P. fragrans), is a close second to peppermint in my list of favorites. 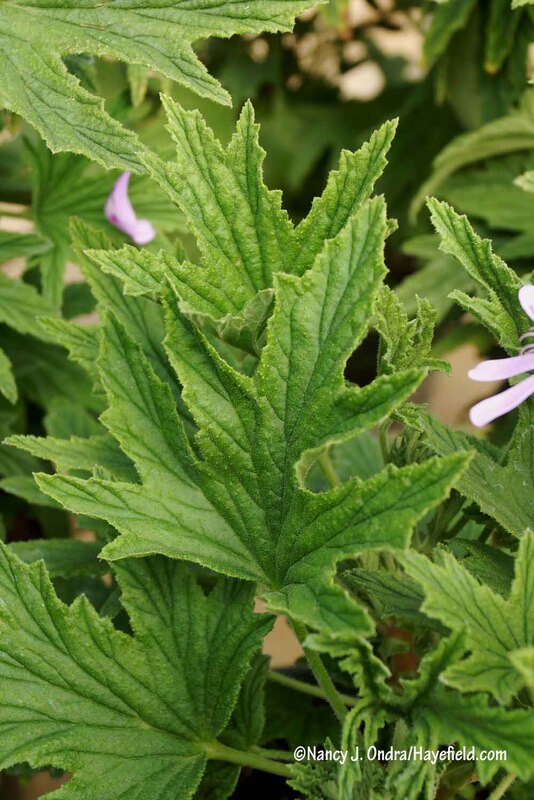 Its grayish green leaves have a velvety feel and a wonderful scent I can only describe as “warm.” The plants are on the smaller side, so they work well as fillers in container combinations, in pots by themselves, and in hanging baskets. Apple geranium (P. odoratissimum) is also quite nice: very similar to nutmeg in size and habit, but with an apple-cider scent. 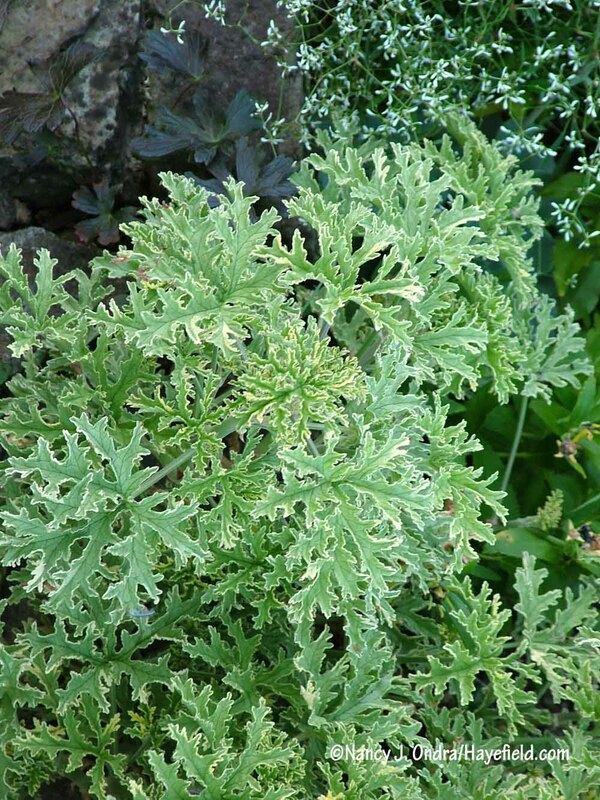 …and types with distinctly lacy leaves, such as ‘Skeleton Rose’ (also known as ‘Dr. 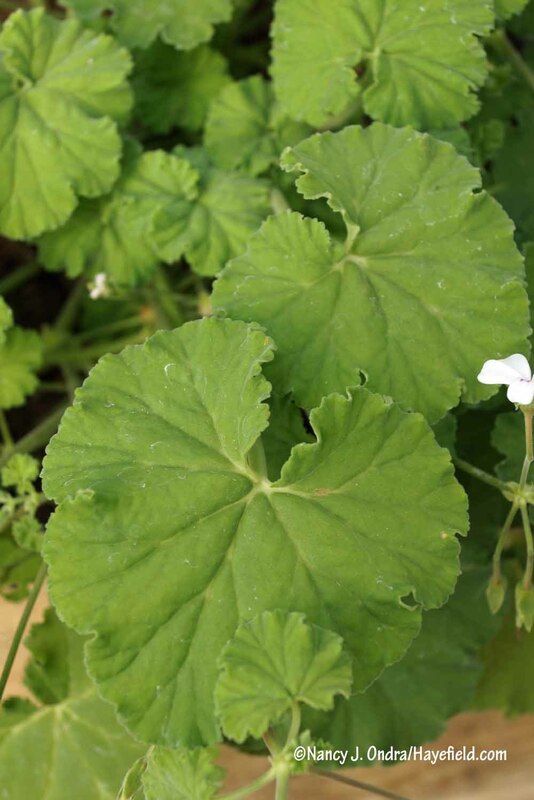 Livingston’) and fernleaf geranium (P. denticulatum ‘Filicifolium’). 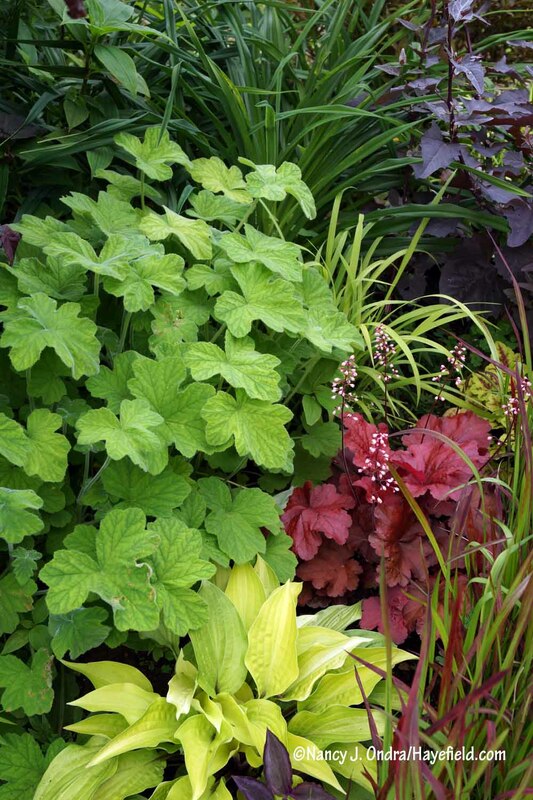 When you’re planning container or garden combinations with scenteds, give them a bit more visual interest by choosing partners with contrasting leaf shapes and sizes: small with large, for example, and broad with narrow or deeply lobed. 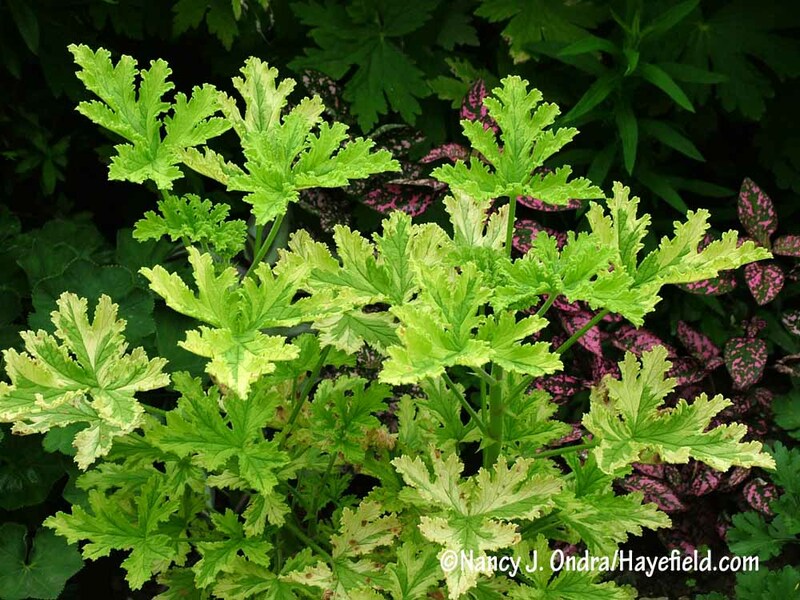 Color isn’t one of the first traits that comes to mind with scented geraniums, but there are some interesting options besides the many shades of green. The scenteds have produced a number of variegated sports in a variety of patterns. 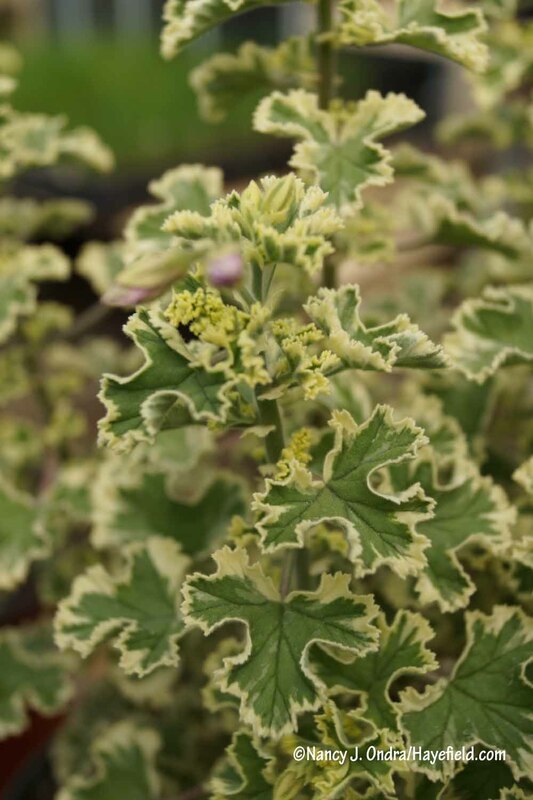 Just keep in mind that the variegates can also revert back to their all-green origins, so keep an eye out and remove those ordinary shoots if you want to keep the best show of variegation. 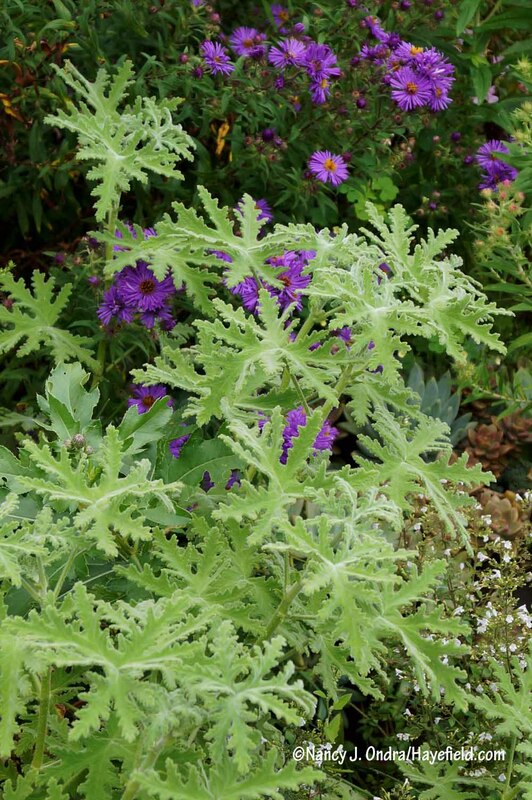 Even on one plant, the color and amount of variegation can vary depending on the temperatures and light levels. 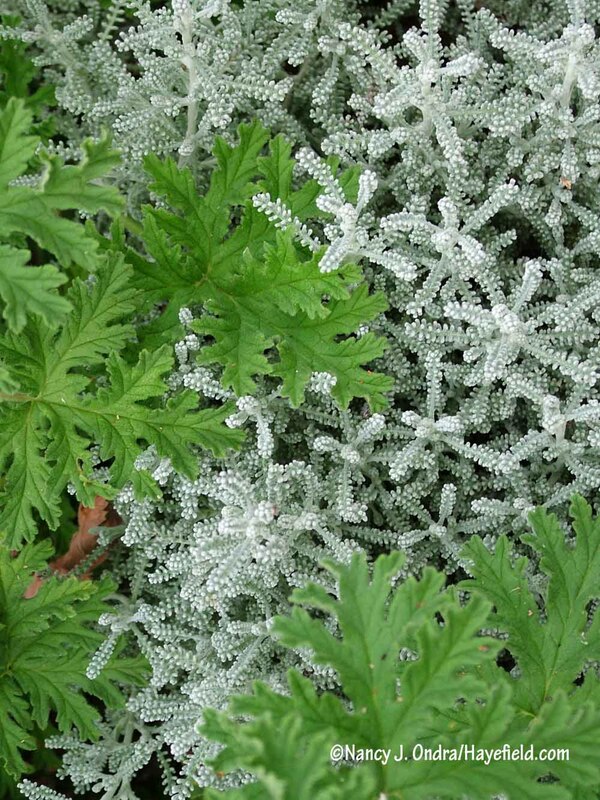 Several have grayish to silvery foliage, including ‘Old Spice’ and ‘Peppermint Lace’. Some also have brown blotches in their leaves. That’s how ‘Chocolate Mint’ got its name, for instance: It doesn’t actually smell like chocolate mint but rather is somewhat minty with chocolate-brown markings (most noticeable in cooler weather). ‘Fair Ellen’ and ‘Purple Unique’ are just two of the others with dark markings. Flowers are perhaps the least interesting feature on most scented geraniums, though they can add a bit of extra “something” on some. 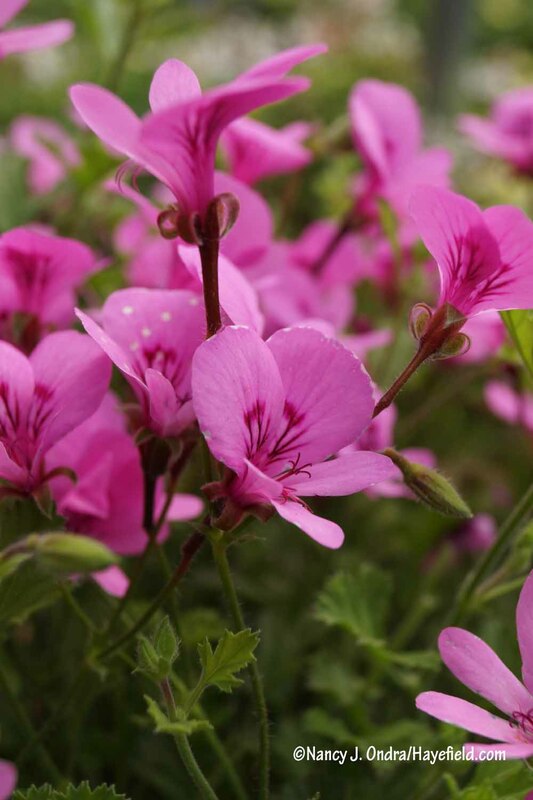 Most are relatively small and in white or dainty pink tints. Some are more intensely colored, or interestingly marked, though. The key to getting the best from scenteds is keeping them close, so you can easily rub the leaves and release their aromas. As I mentioned before, growing them in pots and planters — either alone or mixed with more colorful companions — is a great option. That keeps them within easy reach and allows to to grow them on your deck or patio, or next to your favorite garden bench. Or, plant them along a path so you can pet them as you walk by. 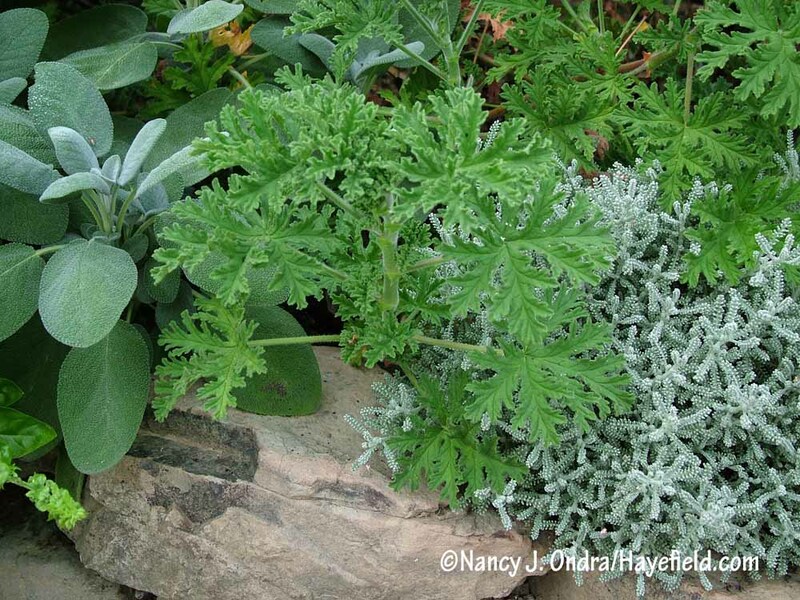 Scented geraniums are right at home in herb gardens and cutting gardens, as well. The leaves are fantastic in fresh bouquets and nosegays, and what a joy it is to harvest and work with them. (Your hands will smell wonderful for hours after!) The leaves also hold their scents well when dried, so you can use them in dried arrangements or potpourri too. If you can’t find scenteds available locally, you’ll have to try mail-order sources and depend on their descriptions rather than the exact names. 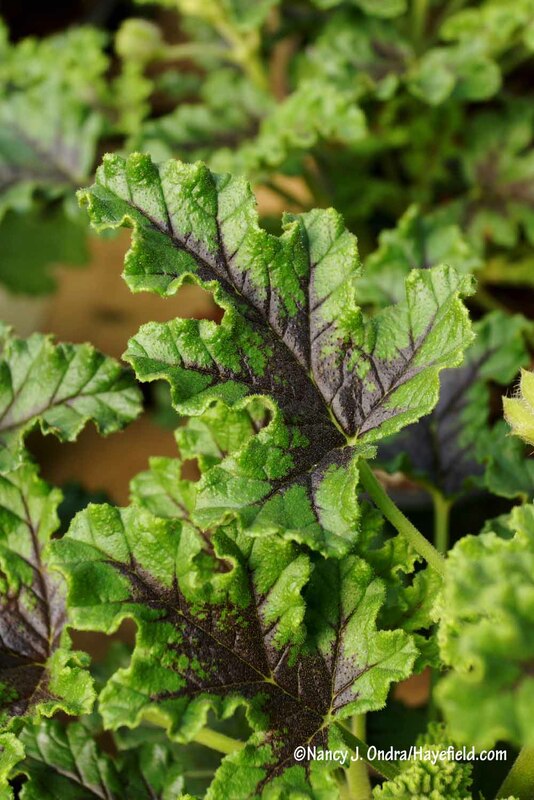 Some online sources that offer a good selection include Colonial Creek Farm, Geraniaceae, Mountain Valley Growers, Select Seeds, and Taylor Greenhouses. Pick a few fragrances that sound tempting to start, then try a few new ones each year. Even a rooted cutting can grow quickly, and it’s pretty easy to overwinter your favorites indoors, so they are worth the small investment. You could keep them on a sunny windowsill or under lights, but I generally keep mine in my unheated basement just above freezing, with about 3 hours of light a day and just a little water. They look rough by spring, but once I cut them back and set them outside after our last frost date, they regrow in almost no time. 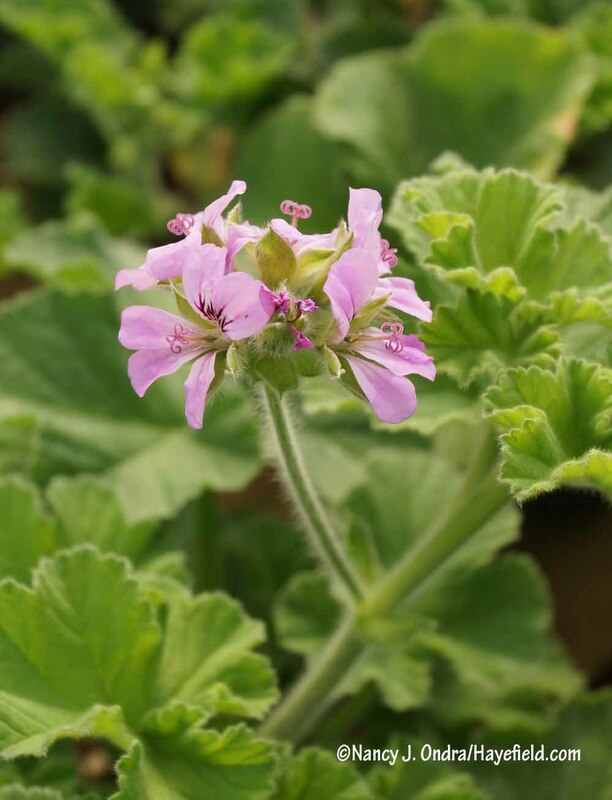 It’s pretty easy to grow scented geraniums from seeds — much easier than trying to find said seeds for sale, as the seedheads fling them some distance when they’re ready, making them tricky to collect. 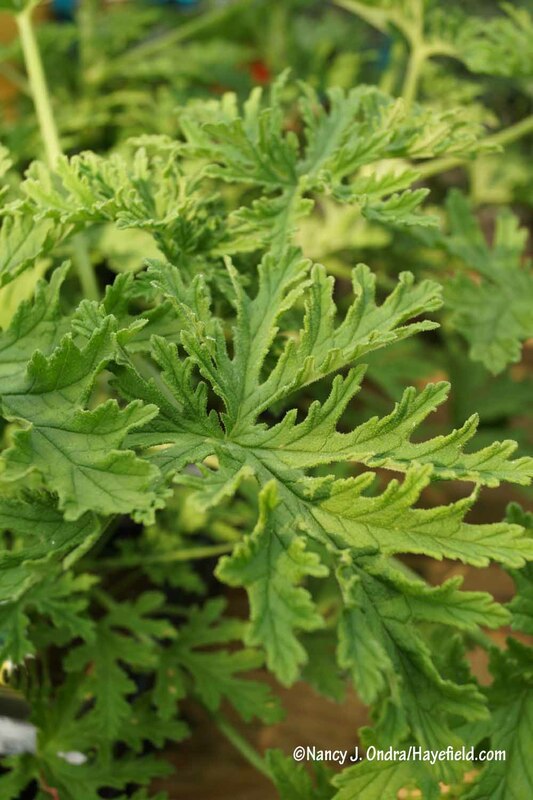 I’ve seen seeds of coconut-scented geranium (P. grossularioides) for sale on occasion: Terrior Seeds has some available as of mid-February 2017. It’s also interesting to note that coconut, apple, oakleaf, and some others can self-sow freely, so if you start growing scenteds, you may end up with seedlings to share, and possibly some interesting hybrids as well. I’ll meet you back here next month. At the rate we’re going weather-wise, I may have blooms to share for Bloom Day; if not, I’m sure I can think of something else to write about. Until then, think spring! So glad you are back! I’m ready for spring! 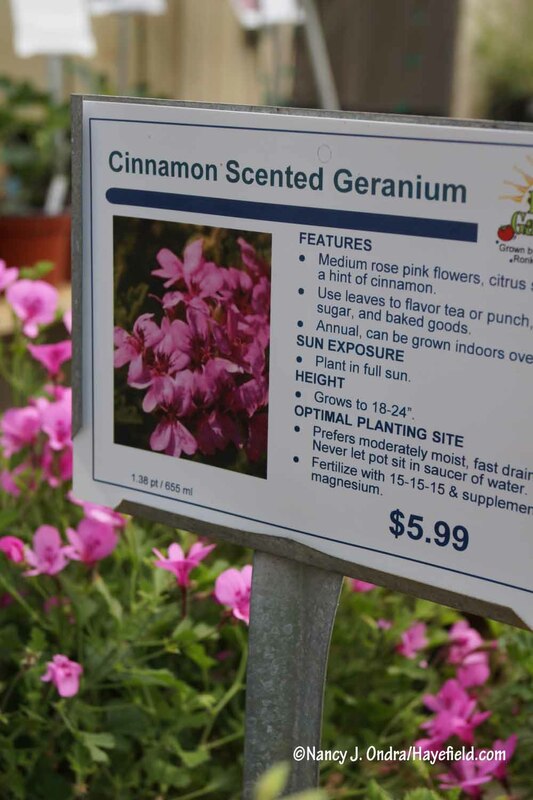 I’ll start looking for those scented geraniums so my favorite garden store. Thanks! It’s been a busy winter, but we’re finally putting the finishing touches on the magazine I’ve been working on. It’s off to the printer tomorrow; then it’s back to the garden for me. By the way, Ott’s Exotic Plants in Schwenksville, PA, is a good local place to check for scenteds once spring arrives. Hi Nan, you have sure stirred up some fond memories with this post. In the 90’s around here we were going through a scented geranium phase. You could get them at the local nurseries. I remember the lady that introduced them to me when I first moved here with my husband. It is funny how such lovely plants can go out of favor. I think you post has awakened a “need’ for some in my garden again. Crazy weathers here. We are having May weather right now and it doesn’t seem to be abating in the near future. I actually have crocus blooming. Hi Lisa! It’s neat to hear that you too have good memories of your experiences with scenteds. The more people know about and ask for them, the more likely it could be that new sources start offering them. Crazy weather here too. I have some hellebores that should open in the next few days, and snowdrops too. How excited I was to open my morning e-mail and see there was a Hayefield post! My work screeched to a halt. I put on the teapot and headed for the recliner. So good to have you back! 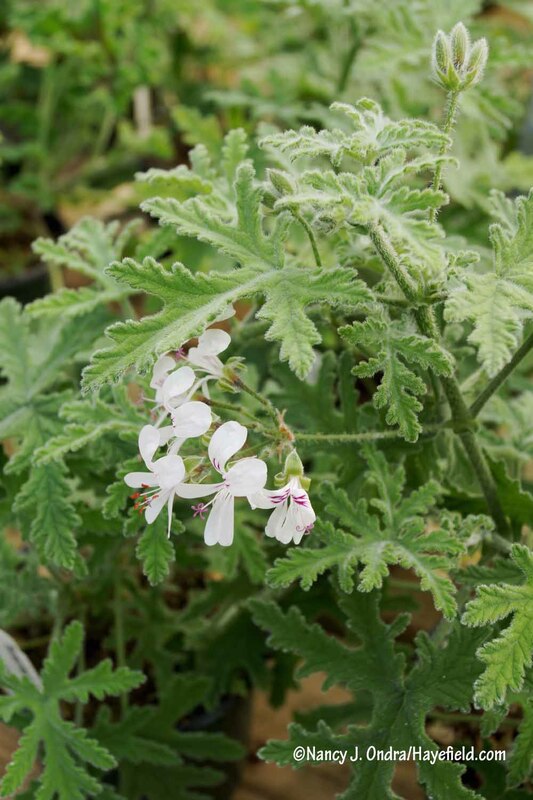 Spring must be just around the corner Peppermint scented geranium is my favorite too! Here in my garden I always place pots of them on either side of the daycare mud kitchen. The kids call scented geraniums “scratch and sniff” plants. They “cook” with them often in their sand pies😀 They’ve even created a sand potpourri. They lay the leaves to dry in the sun. Then crush them with a mortar and pestle with flower petals and sand. I hope their childhood memories are creating the gardeners who will keep these plants on the market for future generations. We carry about seven varieties at the greenhouse I work at and most people have to be lead to them and shown how to rub and sniff before they pay them any mind at all. Be well and happy, Nan! Hey there, Liz! How wonderful that your kinds already have happy associations with these wonderful plants. It’s also great to hear that you offer so many varieties for sale where you work. “Scratch and sniff” indeed! Hi Nan, what a welcome post in mid-February! I’d given up on scented geraniums, as I have so little sun and they didn’t grow well, but you have inspired me to give them a try again. May even take a ride out to Ken’s to pick up a couple! Looking forward to another great season on your posts! Good morning, Lorraine. 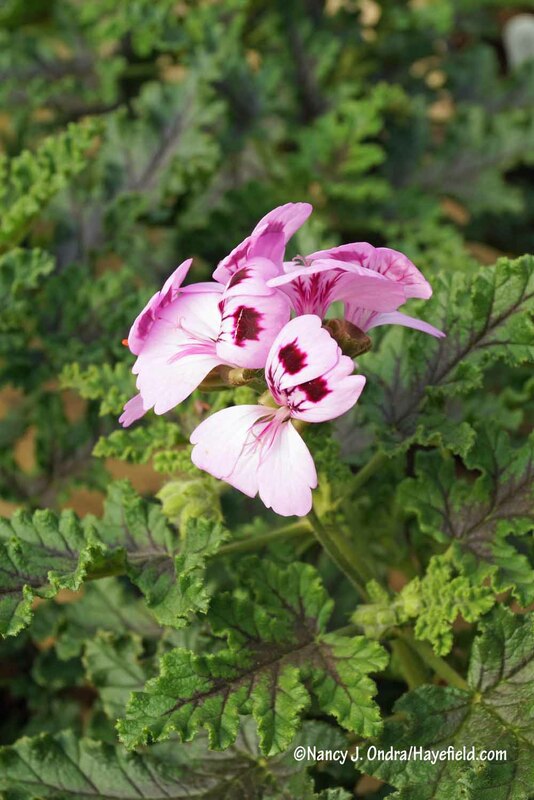 Ken’s is always worth a visit, but the scented I’d suggest for you–the regular peppermint geranium, which seems to do just fine in some shade–is one they don’t offer. It’s worth buying one by mail-order, though. I’ve missed your post. I love scented geraniums. I have the ‘lady plymouth’. I think it’s so pretty. 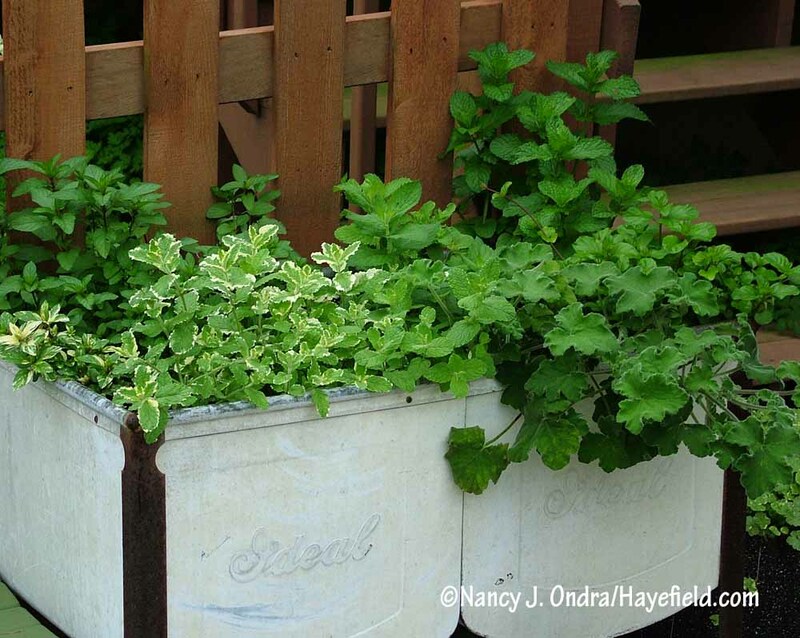 We use to have a huge grower of herbs and scented geraniums in Chesterland, Ohio…but they’re gone now. I’m talking over 30 years ago when you couldn’t find these plants any where else. Hey there, Mel. 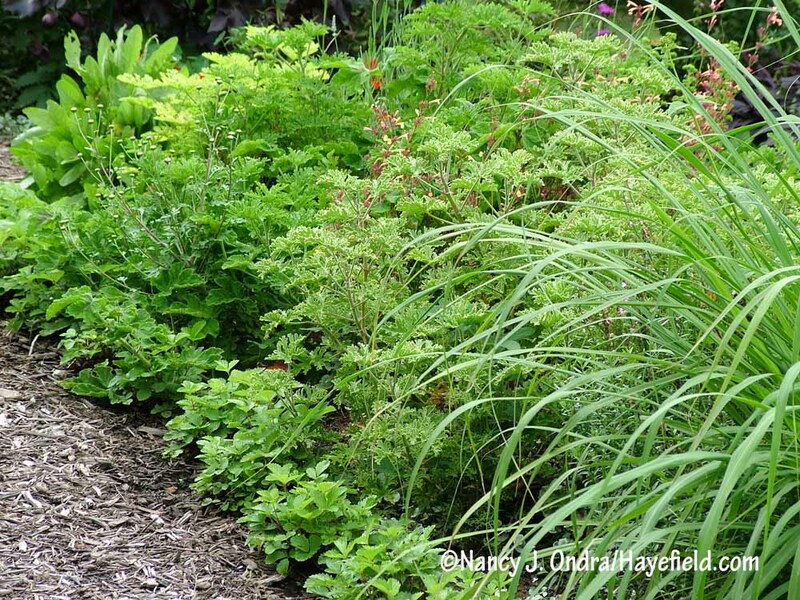 Have you ever been to Mulberry Creek Herb Farm in Huron, Ohio? 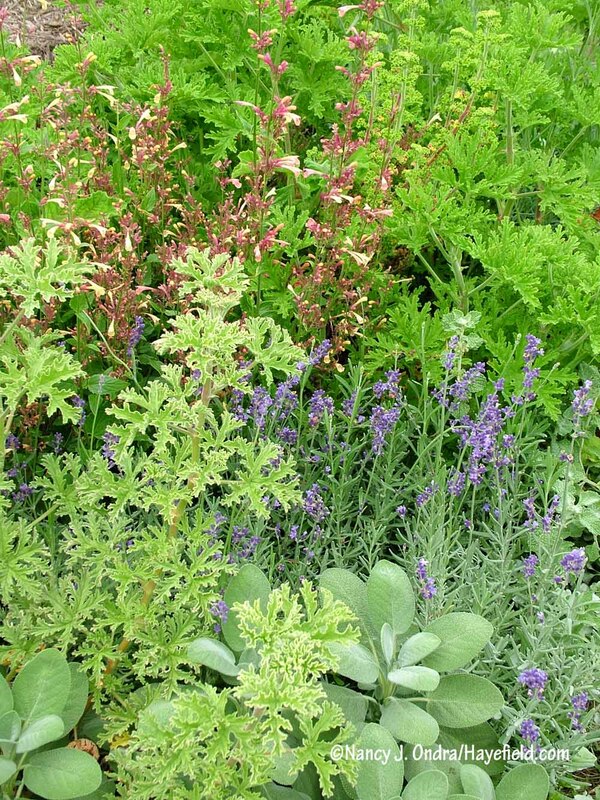 It’s sad that they no longer do mail-order–I got some terrific plants from them back when they did–but they still do on-site retail and offer an excellent selection of all kinds of herbs and other interesting plants. No I have not been there. I’ve looked at their website many times. I’m sad that they no longer do mail-order too. Maybe this year I’ll go for a visit. Hi Clara. I was so pleased that I got to meet Adelma on our visit, and I had her sign one of the booklets she produced (I have several of those, and her book Herb Gardening in Five Seasons). Thank you for mentioning Joanna Reed too; another gardening legend and an incredibly kind, generous, and gracious lady. Both of them inspired me greatly in developing my own gardening style and my love for “personal” gardens. Amen to that, Nan. Ditto on the booklets and book. I think we were both fortunate to have such wonderful mentors. Another wonderful example of a gardener who was more interested in plants than in self-promotion. These women may not be famous in the traditional sense, but they won’t be forgotten, either. Nancy, great to see you back online. Thanks, Barbara. It’s good to be back! I love these and keep thinking I should try to educate myself and get serious. So thanks for this information and all these lovely images. I could almost smell them! Hey, Linda. Maybe you shouldn’t aspire to be “serious” about the scenteds. I try to not get too fussed about their correct nomenclature and just enjoy them for what they are. Yes, once you get familiar with their fragrances, just seeing a picture can be enough to evoke the scent memory. One of my favorite subjects! They’ve never gone out of fashion with me. I first started with the Scented Geraniums 40-some years ago when I met an older gentleman in Iowa who collected them, had a bunch under lights in his basement. For the last 30-some years we were in San Diego County, Caliifornia where the Scenteds thrive and I had many that I’d carried along through the years. We moved 3 years ago to the farthernmost reaches of Northwest California…Pacific Northwest territory and I did not bring cuttings of my Scenteds along, thinking they would not do well here. 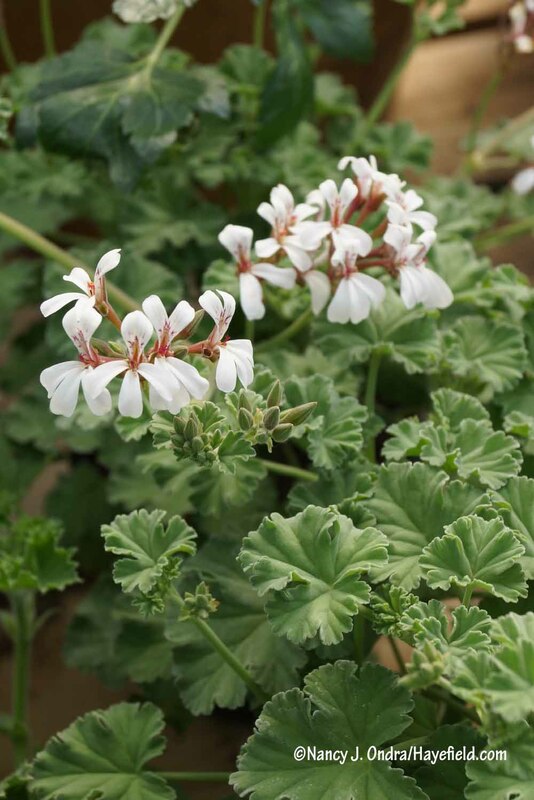 I did however find a few seedlings of the Coconut Geranium in some of my brought-along pots, not surprising given their nature of happily reseeding all over my previous property. So…..I did put them into the ground, really expecting to lose them and they have amazed me. They have been in the ground about 3 years and sail through our waterlogged soil and freezes without blinking. I’ve learned also that set amongst my grasses of various shades that at certain times, when their thin stems are reaching high with flowers and seedheads, that they make a pleasing contrast of reddish brown in the overall look of the border. This is the original 3 I planted 3 years ago, looking fresh and thriving in the middle of February…they Always look good and I’m happy knowing once again that i will always have them. I’m now planting more in my beds. That’s a great story, Sherry, and I believe you! I have to admit that coconut isn’t one of my favorites for fragrance, but I realize the plants can vary since they’re usually grown from seed, so maybe I just haven’t met the right one. My main love is grasses..grasses, grasses, grasses. I had a bunch, yes, a bunch, and last year you so generously sent seeds of more to me. They were sown and planted out this past Fall and I’m anxiously awaiting a new season for them to grow large. The bad news on my new property is realizing this past year that Vericilliumm Wilt has shown up on the property…and I’ve lost some plants…some make it, some don’t…and this would kill me if it were not for my new found knowledge that the grasses are immune. I can hardly believe it, it would have been so very difficult for me to accept if I could not grow grasses here and I’m lucky enough that they are immune and I know I could / can be quite happy growing nothing but grasses if that were the case. Penstemon are immune also and okay, I could groow grasses set with penstemon amng them and be happy…LOL…and fortunately there are other plants that are immune also. I am so pleased that fortune has smiled upon my grasses…and thank you once again for the seeds of all my grasses that I’m looking forward to in this new season. That’s such good news about your grasses, too! Best of luck with them, and with finding other plants that will thrive as companions. I foresee a beautiful growing season for you! Great to see you post about the scented geraniums. Thanks, they are all so beautiful. Winter here in Savannah seems to be over (cross fingers!). Will look for a few of these to add to the garden. I’m sure you would enjoy them as much as I do, Mary. Looks like we’ll be getting an early start of spring here too! Welcome back dear Nan!!! I am so happy to have you in front of me (virtually speaking!) again. 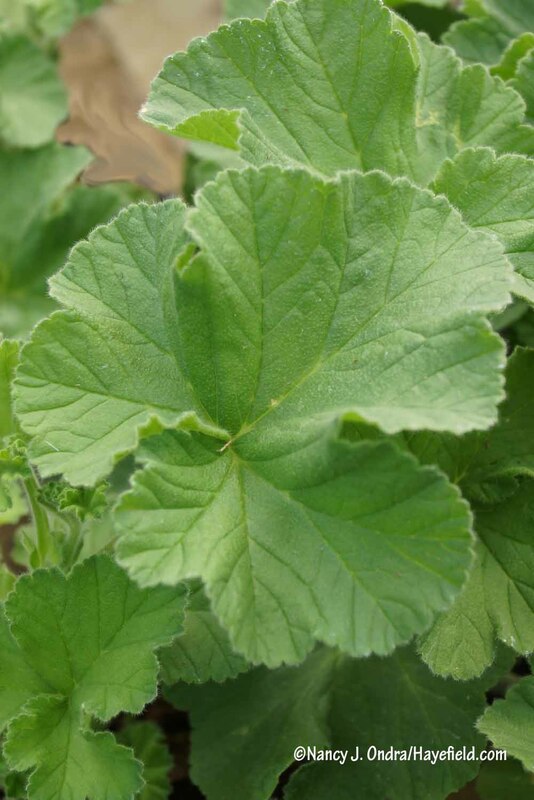 By the way, today I saw the first Smirnium perfoliatum seedling of my summer sowing….could that be a sign of your return?!! Hi, Rox! So good to hear from you. What a coincidence that the first Smyrnium showed up at the same time I did. I wish you a glorious spring! Thanks for this post, Nan! 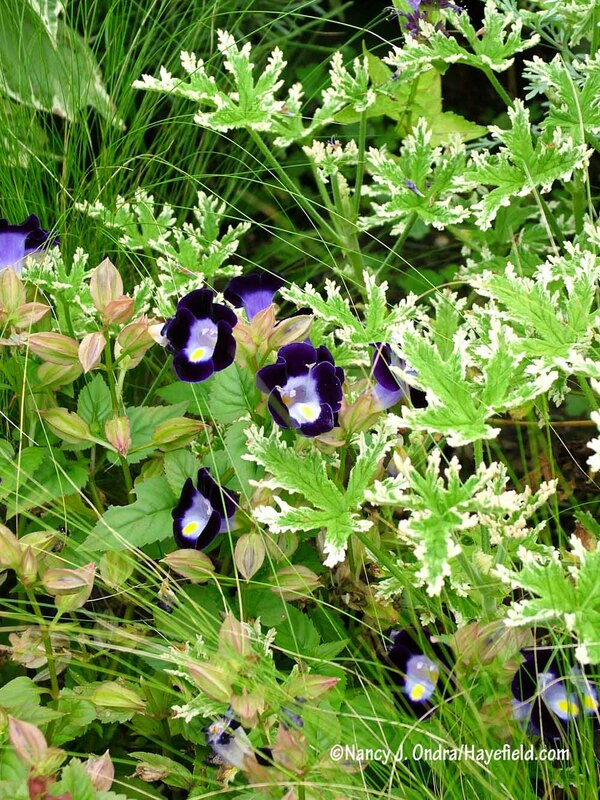 You have a lovely – and broad – collection of scented geraniums. Many of them do exceptionally well in Southern California and some are prolific spreaders. 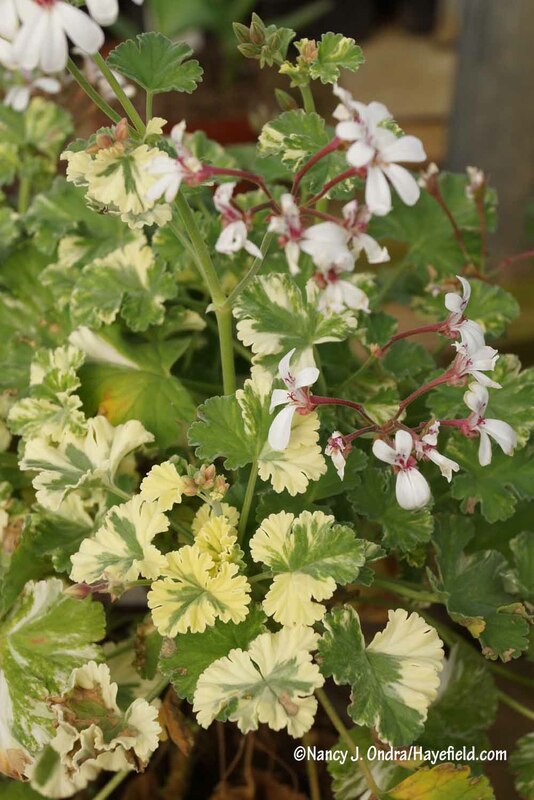 I’ve made extensive use of Pelargonium tomentosum as a groundcover – it seems to hold up well for about 3 years and then drop dead so I try to keep cuttings on hand when it becomes necessary to replace it in an area. I just planted ‘Chocolate Mint’ and hope it’ll do as well. Another species, which I know only as ‘White Lady’, has done a nice job spreading itself along my neglected back slope, despite the fact that last year’s horrific June heatwave killed off many other plants in that area. ‘Oldbury Duet’ is another of my favorites but it’s just a little finicky. 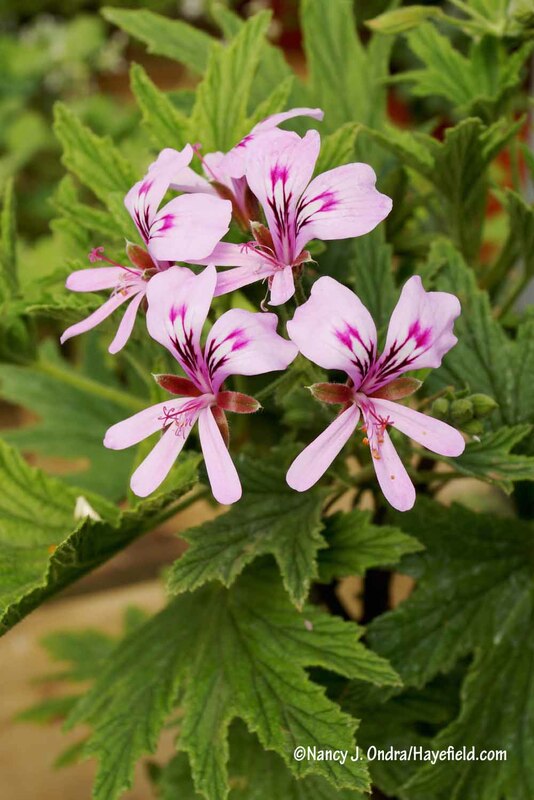 You post has encouraged me to look for a broader range of these Pelargoniums to fill in some of the tougher areas in my garden. 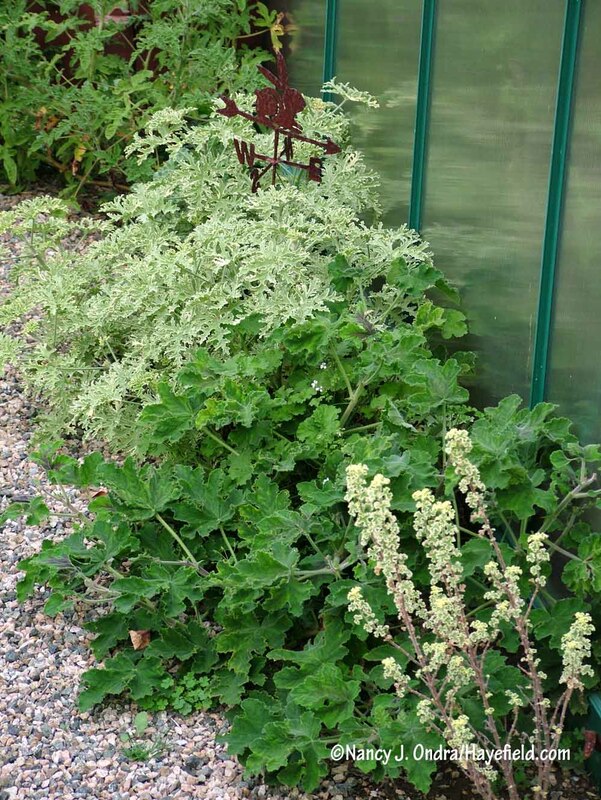 Using the peppermint geranium as a groundcover sounds wonderful, Kris. I’d want to flop down and roll around in it. I’m not familiar with ‘White Lady’ or ‘Oldbury Duet’; I’ll have to look for those. I wish I could overwinter them in MI. I lose several every winter inside. Any tips? Hi Susan. 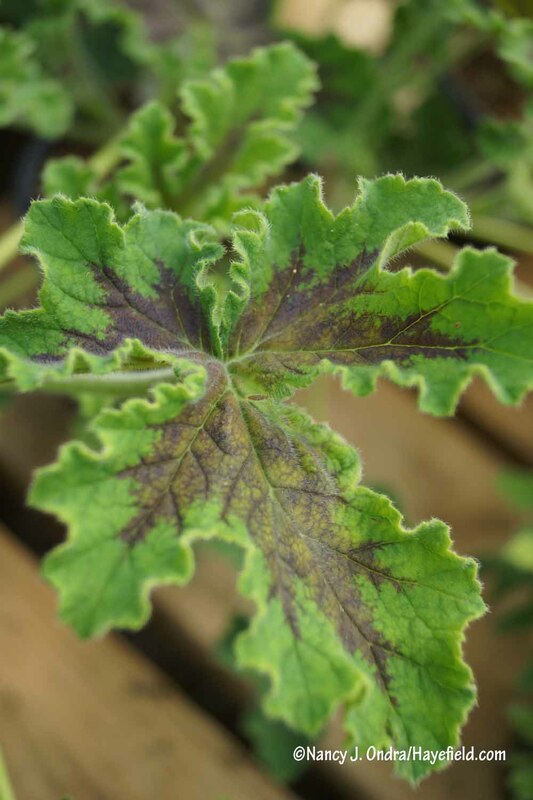 I can’t give you firsthand tips on keeping them actively growing, since I let mine go almost dormant, but I can direct you to this care sheet from Logee’s: http://www.logees.com/scentedgeraniums. Always great to see a post of yours come in! I’m a little ashamed that I always used to consider scented geraniums as old lady plants, but ever since a few cuttings were given to me I’ve been showing them much more respect. I have a few growing under lights and I love their scent when I work around them on the other stuff, and like you suggest I try and add another one or two each year even when I’m distracted by all the other flashy spring flowers. Beautiful photos of them in the garden! “Old lady plants,” huh? I’ll let you slide on that, since you admit you now appreciate the virtues of these mostly unassuming plants. I imagine you’re already busy with seed-sowing for the upcoming growing season. I hope it’s going well! Hi Sandy! Thank you for the reminder about the Herb Society sale. If the forecast for our weekend weather is accurate, we should have no trouble finding flowers in bloom very soon! Glad to see you blogging again, Nan. My biggest challenge is finding good nurseries around here. My closest independent garden center just closed which is not the direction I want things to take. Of course there are online nurseries but I would rather try before I buy as you suggest. Oh well. I hear you, Kathy. As much as I adore peppermint geranium, I think if I could have only one scented, it would be one of the rose types. Or nutmeg or apple. I think most people would find those appealing, so they’d be safe bets for mail-order. 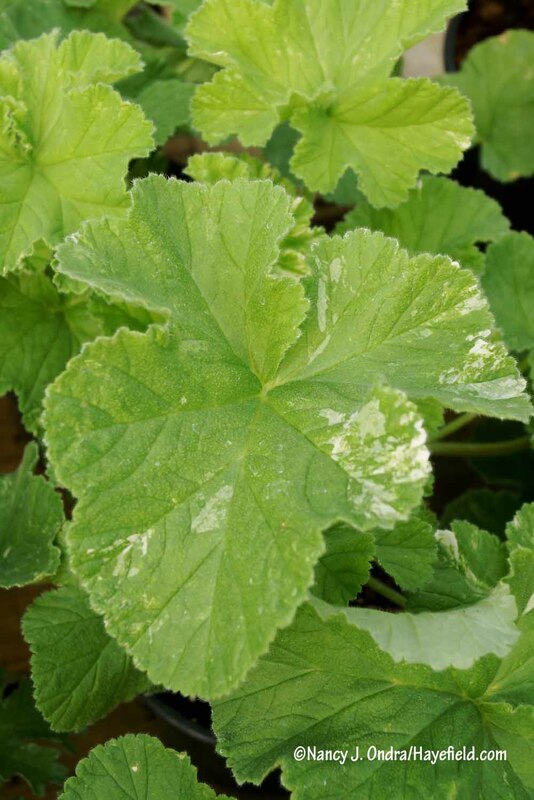 As evidenced by some of the stories in the comments here, scenteds also make great passalong plants, so putting the word out that you’re looking for some may lead to a local gardener who is willing to share. Way back when I lived in my first apartment I grew a lot of scenteds indoors. But since having an outdoor garden I haven’t grown them much and even tried some indoors that I failed to keep alive. Your wonderful and extensive photos awaken a lot of memories of the former delightful scents and textures I enjoyed, Nancy. Perhaps I will have to try again. I have some regular geraniums that grow well on my windowsills and bloom often. They seem nearly indestructible. I enjoyed all your photos, all that is missing is the fragrance. I imagine you’d have equally good luck with scenteds in the same areas where your flowering ones are thriving. Maybe start with just one as an experiment? Hey, Nan. Hope you, Mom and the boys are well. Another season begins. Looking forward to more Hayefield inspirations. Great to hear from you, Tom. We send you the same good wishes in return! Nice to see a post about these lovely plants. Coconut geranium reseeds for me in Yonkers, NY. I’ve come to use it as an annual ground cover for bulbs. I had apple geranium reseed one occasionally, but it isn’t consistent (though I think I like the fruity scent a bit more). Another scented you did not mention but which has very ornamental flowers is ‘Shottesham Pet’. It’s usually sold in the US as a fruit scent – I forget which, maybe apricot? On a secondary note, did you do a seed swap in fall 2016? I was looking out for it but seem to have missed it. Good morning, Klaus. You have convinced me to give coconut geranium another try. I will look out for ‘Shottesham Pet’, too. I haven’t seen it at my favorite local sources, so it’s time to consider an online order. No, I didn’t give seeds away last fall: a big rush writing project took precedence. I do now have fresh seeds up in my Etsy shop; if there’s something specific you’re looking for, let me know. I probably won’t do the big giveaway any longer–it’s getting a little too much to handle, both financially and time-wise–but I’m still happy to share. It’s certainly worth trying a few. You are wet and windy this year; for a change, we have been beautifully mild for much of this month. It is more like April here than February! So glad to hear you spread the good word about scented geraniums. I’ve been wintering a rose-scented, variegated Pelargonium called “Peacock” on the kitchen window sill. The aroma takes me back to some long-gone artisan soap from decades ago. I still find myself sniffing for a facsimile at craft fairs or in wellness shoppes but to no avail. Now, I just go directly to a “Peacock” leaf after washing up the dishes. Russells, a wholesale grower in Richboro, PA, still offers a great selection of scented geraniums at bargain prices. Hi Eric! Thanks for the tip. That must mean that some retailers in the Philly area carry them too. I wish more places up here offered them.